Stupidly no. Initially I thought that I would have to get car up on ramps to get the starter off and the logistics of doing that in my tiny 1942-era single car garage are impossible. So I did nothing. However, I had to take the left front wheel off (and drum) to play with the center-plane brake shoes (not enough lube on the web) and while I had the wheel off, I realized that I had good access to the starter bolts. And still I did nothing. 1. I finally understand the need for the bent "starter" wrench - neither a socket or a straight box end will work on the forward bolt/nut. Where is Sears when I need them? 2. I rationalized that I should wait until I see if the issue was the old starter cable. In the meantime, I asked my neighbour if he could score 4 inches of 1/2" diameter adhesive heat shrink from his sources. 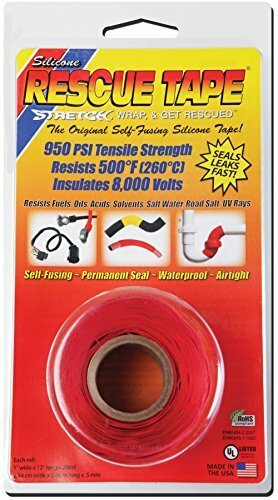 He said why not use the self-sealing silicone tape? I laughed. Yup. That would work. And I have some in my Audi tool box. "Rescue Tape". I presume that the glove box light was staying on even with the glove box door shut (and me checking that it was off). Some how. You won't believe it or care but I went to start the car the other day and found the battery to be 100% flat. Not even enough juice to power my electronically converted Town and Country radio on FM. Had to use my Lithium Ion Jumper pack and even then, it was tough sledding. Drained the jumper pack (Yikes!). Got the car started, did what I needed to do (test the drive shaft Re and Re) and put it back in the garage with the battery charger on. The next day (or two days later), I went out to check on things and start the car. As I sat in the dark garage, I looked across at the glove box. It wasn't fully closed and the light was on. At least now I know why the battery was drained (took several days I guess). That bulb is coming out (again) today. Location: So. California Thanks for the "Rescue Tape" info. I didn't know that heat shrink tape existed. Good to know. I'll give that a try on part of my harness that was frayed a little bit. It will save me from having to tear everything apart to replace it. Speaking of starters; what's odd is my '58 Coronet started very easily and consistently for 2 years, but one night at a car show it stopped cold. It wasn't a power issue as it had plenty of power at the starter. It had jammed itself to a position that it didn't want to move from. I had to get a ride home and come back with a jack, a light, and tools to take the starter out and figure out what to do with it. Once I got the bolts loose enough, it fell into place where it is supposed to sit. Apparently, the last person to put the starter in (about 25 years earlier!) had it slightly ****eyed, but not enough to cause a problem most of the time. Once I had the starter in the proper position, I tightened the bolts back up and it has been working well ever since. Location: Lower Mainland BC After several months of avoiding removing the starter BUT buying a new battery and a Battery Tender Jr. to make the problem go away, I found that I *STILL* had intermittent (you know, the kind everyone loves) starting issues that needed the Lithium Ion battery pack to get me started more than once. Realizing that I finally had no choice but to at least remove and inspect the starter, I did so on Monday (two days ago). I hoped that it was just a brush issue. Nope. They were fine. So on Tuesday, I was able to locate a new old rebuilt MDF 2088 armature ($45) and brushes ($5). Then I took the whole kit and kaboodle to the shop that did my generator in the summer of 2017. They installed the "new" armature and brushes and replaced the bushings. They also soldered the positive power post to the internal field coils, etc. properly (it wasn't). Cleaned it up in and out, sand blasted bits, painted it, reassembled it and tested it. I picked it up this AM. Turns out that the old armature had been banging into and grounding out on the end plate (see photo below) in addition to the positive post issue. Either the required shims were missing or they were broken. Who knows. Gone. Fixed. Picked up the starter this AM (cost only one hour labour because I brought the parts) and put it back in this afternoon. (That top 7/16" x 20 nut is still a pain. I tried to buy a curved 5/8" starter wrench and they aren't at my usual sources Lordco and Canadian Tire). Put the honking hefty 12V power cable back on. (Wrapped the area with the "exposed" wiring with silicone "Rescue Tape"). Lowered the car (had the jack (and stand) under the driver's side frame). Gave the throttle one pump. Hit the key. No starter hesitation. Va-ROOOM! It's A-LIIIVVE!! Maybe now I will STFU about my hard starting issue. (At least I hope so). PS: If anybody has an Autolite MDF 6007 starter with the green tag still on it, I would be interested in buying it, even if it doesn't work. Mostly I just want the shell.